The 2016 Olympic Games will be held in Rio de Janeiro in 2016. In the halo over London, Rio took a spot to portray the excitement in store in that city – perhaps not as well as it could have, in my opinion. More to the point, even as the London Paralympics get underway, the focus of the IOC and many other players is turning to Rio. There is much to be done for the Olympics, across virtually every dimension of games planning. Indeed, Rio is arguably a year or more behind schedule, from wherever that measure might derive. Essential infrastructure, games facilities and venues are yet to be designed, albeit that the main Maracanã stadium, Estádio do Maracanã, is midway into reconstruction. The city has implemented ambitious public transport projects, to cost some $12 billion, to totally recast the city. The Brazil government is supporting major national investments into airports, roads and other crucial infrastructure and working with the Rio State Government on specific projects. The State and city Municipal governments are coordinating plans to release land and property for expansion of hotel and tourism related facilities. Programs to open the favelas, more than 1,000 in Rio alone and under the control of local gangsters, and reduce social inequalities are taking shape. Much of this will draw on government funds, much channelled from the central government. The private sector is also being drawn in through substantial partnership and investment schemes – in relation to the development of the Olympic Park and national airports and infrastructure. These actions are now set against a troubled economy compared with the more euphoric state of mind that prevailed 2-3 years ago. Rio will have a full agenda. In addition to the 2016 Olympic Games, the city will be host in 2013 to the Pope and World Youth Day. Some 5 million pilgrims are expected to visit Rio over the 5 days event. In 2013 Brazil holds the FIFA Confederations Cup. In 2014, Rio along with 11 other cities in Brazil will stage the FIFA Football World Cup. The opening will be in Sao Paulo, the final in Rio’s Maracanã. In Rio, much of the city development work for the Olympics will be midstream and the stress of coping with those programs plus World Cup schedules and visitors will be demanding. In 2015 Rio celebrates its 450th anniversary. It seems that Rio mayor Eduardo Paes intend this to be massive commemoration and in the competitive stakes between Rio and Sao Paulo, an important occasion to re-identify Rio as Brazil’s predominant city. The capital of Brazil was moved from Rio to Brasilia in 1960. The challenge for Rio is real. About one quarter of Olympic projects have been completed and it will be necessary for many remaining projects to be implemented simultaneously. Just an extra level of complexity? Most of the facilities built for the 2007 Pan American Games do not meet Olympic requirements and so those to be used will need extensive rebuilding. Some designated sites have been found to be contaminated and possibly insufficiently stable, calling for major remediation. The Metro that Rio Needs, a nonprofit group, is pushing for an alternative subway route that has received considerable support from urban planners, architects and academics. Displacement of residents from favelas for Football World Cup-related projects are causing controversy. A recent front page article in the Veja newsweekly magazine featured a drawing of a Brazilian athlete holding aloft the Olympic torch high enough that the flame endangered the Olympic rings above. Yet culturally Rio still leads, is arguably the musical and writers capital and is seen globally as the star of Brazil. Globo, Brazil’s main media concern and the largest such entity in Latin America, broadcasts news nightly across Brazil form Rio. This all spells opportunity. It won’t be a free for all. Brazil has its own excellent capabilities. But they will seek expertise and experience from outside and Australians are well-placed to join the Brazilians in the massive developments and expansion of the events business of the next few years. New Millennium Business will be leading exciting and ground-breaking venture to Brazil, so we need to talk! The largest conglomerate owners in Brazil and Rio are, in general, the largest land owners and certainly important movers and shakers in new developments. At the same, such growth presents opportunities for newcomers and three Australian property leaders are engaging. Lend Lease has visited Brazil on fact-finding missions and has appointed consultants in Sao Paulo to assess construction and development project management opportunities. This follows the company’s success with the London Olympic athletes’ village and more widely, its success in a variety of projects the UK and the US – and in Australia. Brazil’s middle class is growing rapidly and private consumption has increased in recent years, feeding directly into demand for retail and industrial space. Westfield Group bought a half-stake in Brazilian retail developer Almeida Junior for $440 million last August. The joint venture is building a large centre in the country’s south. “They already have four shopping malls and have 55 per cent of the market share in the south,” according to Mr Manuel Puig, Jones Lang LaSalle regional director and head of retail in Brazil. Now Goodman Group has announced plans to enter the market, joining with a local partner, possibly industrial, office and building company WTorre. Goodman Group chief executive Greg Goodman has acknowledged the value of partnering with a local company for its knowledge and network. Get yourself ready to target Brazil. Just the opportunities in Rio are worth the effort. 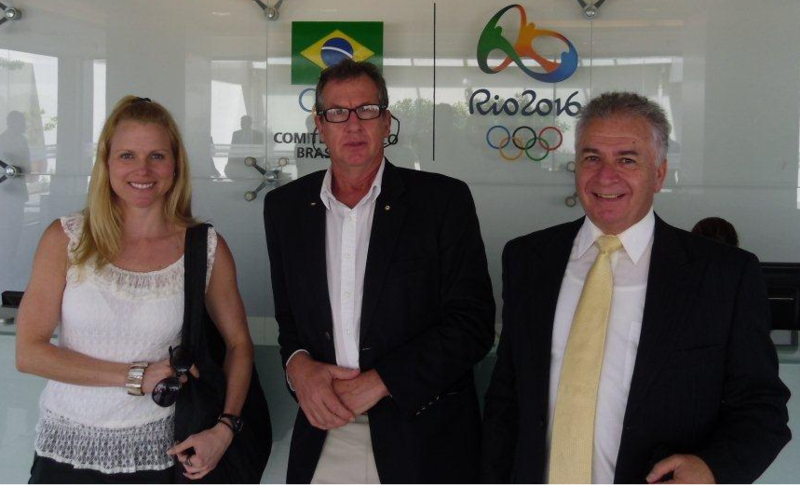 Rio will be place to be, and become one of the world’s quality mega and major events locations. Each major event, be it sport or tourism related, business or cultural, needs a fresh line of attack and innovative tactics. Australian knowhow and experience is highly regarded and now is the time to start planning your market entry. New Millennium Business, in alliance with top-notch local specialists, can help you through the opportunities and challenges you face. We will help you make a difference to your business and to the quality of service you deliver.